Recognition for our latest contribution towards making boating even more comfortable and more accessible came in no small measure today, following the announcement that our patented Vector Fin™ stabilizer design had been selected from 115 original entries, as the outright winner of this year’s prestigious DAME award for innovation at the Marine Equipment Trade Show (METS). The Dame Award is the world’s number one international design competition for new marine equipment and carries a lot of industry prestige and a worldwide commercial impact. To win the DAME is the ultimate accolade for companies and innovators, and all the nominations for the award are seen as trendsetters for the next generation of product development. 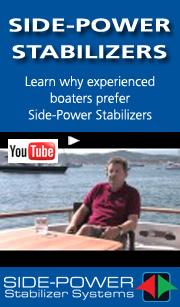 "Sleipner Motor has thought out of the box to produce a fin that better suits many of the modern hull forms to which stabilisers are becoming a standard fit. The elegant curved shape of the fin beneficially directs force to improve roll reduction and decrease the side effects of yaw and sway. It also increases the leverage arm around the vessel’s rolling point and minimises drag. This is an incredibly simple solution to improving the experience of boatowners and their guests. The Jury also noted the slimline form of the vector fin’s SPS55 actuator, a welcome design feature that will assist designers and boatbuilders." Accepting the Award on behalf of Sleipner Motor AS, was inventor of the product, Ronny Skauen. " This Award means a lot to us. Product development is the very core of Sleipner. With the new and more efficient design of the Vector fin, we believe this is not only an important product for us, but for the boating industry as an whole, ultimately allowing more people to become boaters, who otherwise might have chosen not to. It seems that the jury have thought exactly the same! ", says Ronny Skauen happily. Sleipner, best known for their world leading Side-Power thruster systems have invested heavily in the development of their Fin Stabilizer system over the last years, focusing on practical efficiency for modern boat design and technologies, unrestricted by traditional perceptions, as mentioned by the jury in the DAME award, thinking outside the box to improve the products basic functionality and efficiency. "Being boaters ourselves, the DAME AWARD is a truly rewarding appreciation. And to go all the way to the top, being awarded the Overall Winner price, makes me very proud of the company and our dedicated employees", says managing director Arne Skauen, who has run the company since 1977.